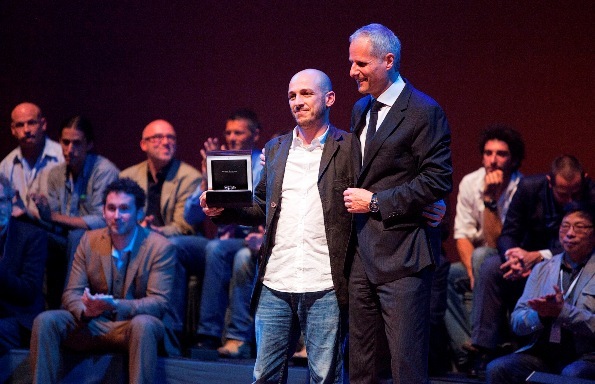 Maurice Lacroix handed over the "Follow your convictions" grant, worth 20.000 Euro, at the World Press Photo Awards Ceremony in Amsterdam on May 7th for the first time. Winner of the grant is Italian photographer Davide Monteleone for his story proposal "Reversed See". With this grant, the production of this story will be supported and further exploited. Maurice Lacroix is the official watch partner of the prestigious World Press Photo Awards Ceremony. The grant jury consisting of Nicole Aeby, Daniel Schwartz, Philippe Dudouit, Michiel Munneke and Martin Bachmann has chosen the submission of Davide Monteleone because of its concise concept and the potential to highlight a multitude of thematic aspects, allowing for differing visual and technical interpretations. The story has a specific underlying idea that is historically rooted yet contemporary. The jury further says: "Davide's language is rich and colorful and he shows great ability to convey the essence of any subject he chooses. Looking for excellence and high quality, given the complexity of the story proposal and its options, he is the ideal recipient of this grant." World Press Photo is an independent, non-profit organization committed to supporting and advancing high standards in photojournalism and documentary photography worldwide. It strives to generate wide public interest and appreciation for the work of photographers and for the free exchange of information. From its office in Amsterdam it organizes an annual contest, exhibitions, educational programs and a variety of publications. Since 1955, more then 2100 World Press Photo exhibitions have taken place in 450 cities in 115 countries around the globe. The exhibition of prize-winning photography will be shown at the Oude Kerk in Amsterdam from 22 April to 19 June and subsequently visit over 100 locations around the world. Since the launch of its first watch model in 1975, Maurice Lacroix has to become a sought-after Manufacture brand. With its own workshops producing complex components for mechanical calibres, Maurice Lacroix joined the exclusive league of Swiss Watch Manufactures at the end of 2006. Thanks to continued innovative development in both technical fields and design, Maurice Lacroix has registered several patents and trademarks. Maurice Lacroix is one of the few independent watchmakers and employs more than 200 people worldwide, the majority of whom are based at the international head office in Zurich and the production facilities in Saignelégier and Montfaucon in Switzerland.